Joe Skarz’s move to Halifax offers a chance to put a nightmare season behind him. 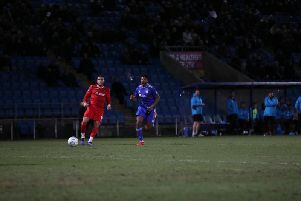 The left-back played the fewest games in any season of his professional career at Bury last term after he tore his calf and fell out of favour, resulting in only seven appearances all term. Before then, the Huddersfield-born defender had been a first-team regular at the likes of Huddersfield, Oxford and Rotherham, regularly clocking up more than 40-games in a campaign. But his calf injury ruled him out for 11 weeks last season, after which he struggled to re-establish himself at Gigg Lane. “That prevented me from playing all season really,” he reflected. “I’ve been quite lucky with injuries in that I’ve not had too many bad ones, but it was quite bad. “The injury at Bury happened about a month after I’d joined. “You want to get back as soon as you can but then you end up pushing it too soon, and then you get a setback. “I only played seven games last season. I think every season before then I’d played around 40 games. “So that was really frustrating, and when you miss a large chunk of the season, you’re rusty when you start playing again. Does his experience last season make him appreciate being back on the pitch even more? “Massively, yeah. I missed it,” he said. “I could easily have stayed at Bury, until January maybe, but I wanted to come out and play games. “That’s what I play football for. I want to play games while I can still do it, which is part of the reason I came here. “I’ve loved being out there again. The main thing for me is getting back to playing regularly. “I want to get back to playing Saturday-Tuesday and get into a rhythm, because that’s when you play your best football. Skarz admits being on the sidelines so often can knock your confidence. “I think it does, yeah. you end up over-thinking things, but when I was out of the team last season, I had my fiancee and my little girl at home, and that’s what you play football for, for your family,” he said. “You want to make them proud, that’s how I look at football now. “When you’re young and you don’t have kids, it’s your sole focus. It’s your be all and end all, and sometimes I think that’s where young players over-think it, your mistakes or playing badly. “But when you have children I think it changes your whole way of looking at it. Skarz has known fellow Town player James Berrett since he was eight and played with him and Clarke at Huddersfield. “I spoke to Nathan (about joining Halifax). I’d see him in the supermarket sometimes.